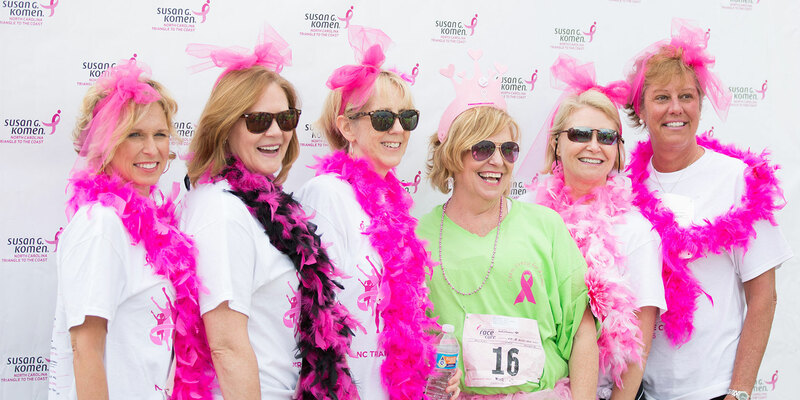 The Susan G. Komen North Carolina Triangle to the Coast was founded in 1997 with a mission of combating breast cancer by providing funding for breast health services, breast cancer education, and outreach throughout its 29-county region. 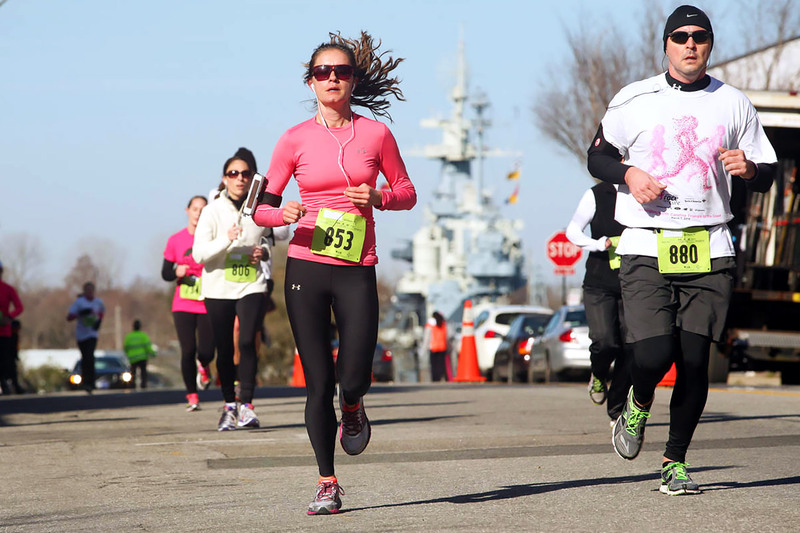 The organization raises money and awareness by hosting yearly events like its iconic 5K race. Each year, the organization sets ambitious fundraising goals in order to meet the needs of those it serves. 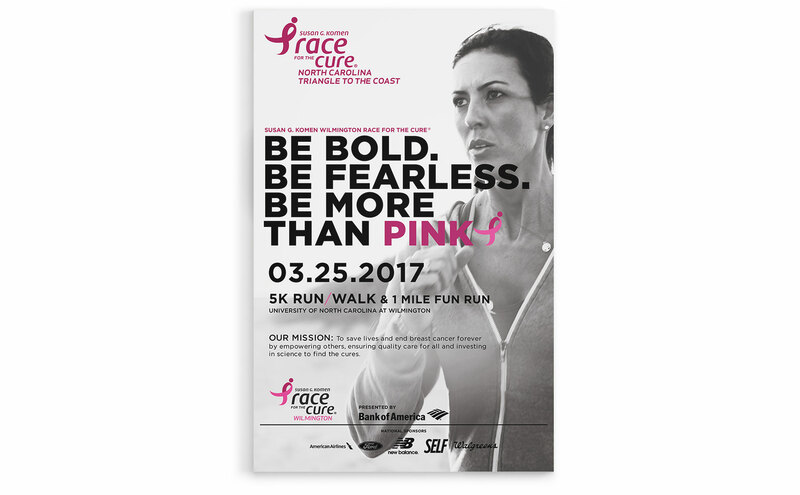 Race registration fees support those goals, but Komen NCTC also relies on sponsorships from and partnerships with local businesses. 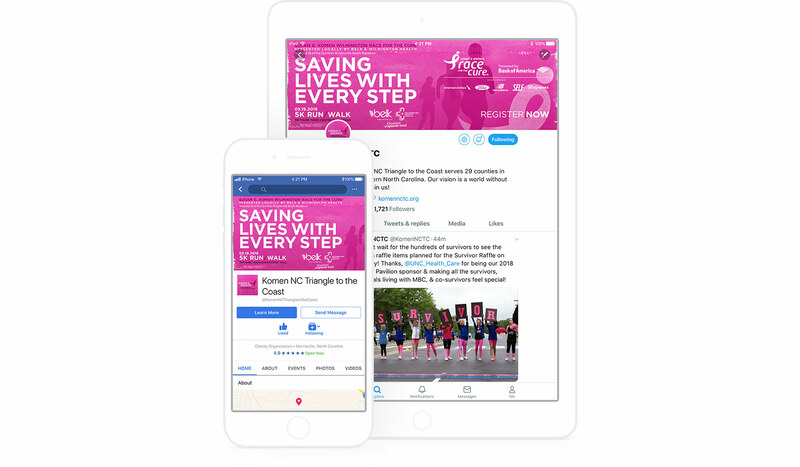 To gain and nurture that support from business owners, Komen NCTC releases a yearly marketing campaign to remind its partners — both current and potential — of the value of their support. The goal of each yearly campaign was to persuade the audience of the benefits of supporting Komen NCTC. Campaign materials appealed to logic and emotion with a delicate balance of tone and content, outlining the sponsorship opportunities alongside the number of lives that could potentially be saved with the additional support and resources. To reach the largest number of people, the campaign theme had to be one that could stretch across both print and digital mediums. Our design and copywriting teams were tasked with developing an overarching theme and adapting it to print brochures, flyers, post cards, print advertisements, social media graphics, and web banners. The campaign featured individual survivor stories to reinforce the relatability of the Komen NCTC message and mission. Our most comprehensive campaign execution, the 12-page sponsorship brochure, highlighted these stories first before detailing the numerous levels of sponsorship. The copy was direct, with straightforward headers like “Our Promise” and “What We Do,” but interspersed with these mission statements and inspiring quotations from survivors and Komen NCTC founder, Jeanne Peck. We tied all the executions together with visual elements like a pink film strip and subtle floral background textures. The sponsorship brochure appealed to business owners, asking for their support as a sponsor or year-long partner. 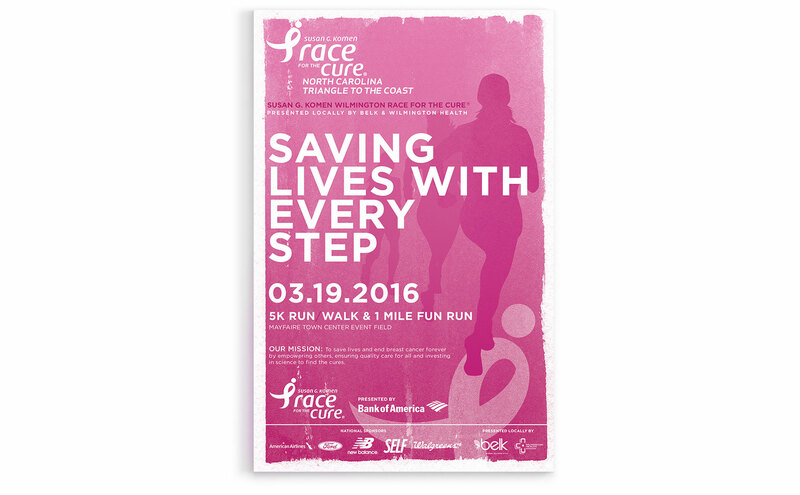 A postcard, web banner, poster, tent card, and social media graphics encouraged people to enter the 5K. An email banner requested volunteers for the race. 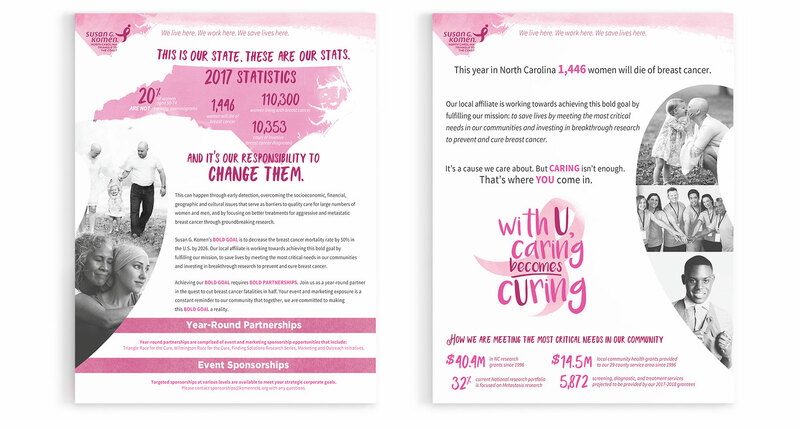 Our copy explained Komen NCTC’s history and mission while icons, statistics, and bulleted lists broke up the longer paragraphs and communicated the message in a more visual, immediate way. The optimistic theme carried through the rest of the sponsorship brochure. We set inspiring taglines in a large, easy-to-read typeface and created whimsical, simple icons to lend visual interest to the straightforward sections featuring sponsorship levels. 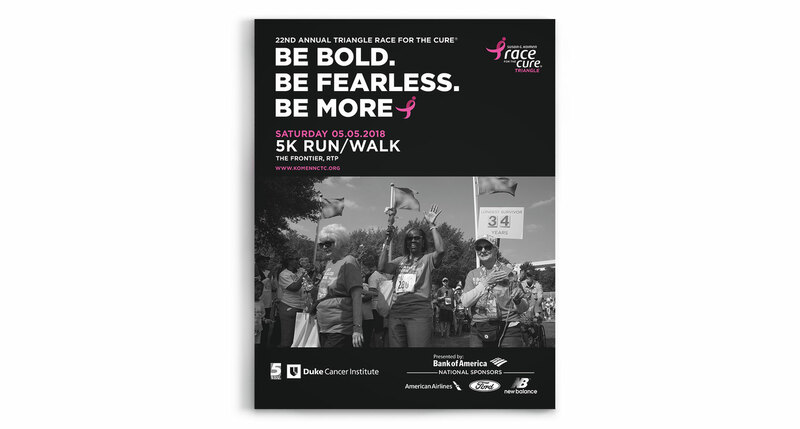 We tied all the executions together with visual elements like a rough textured background, organic icons, and bold typefaces, adhering to the latest Susan G. Komen® Brand Guidelines. We reinforced the “Be Bold” theme with direct copy set in a simple, utilizing the sans-serif typeface. 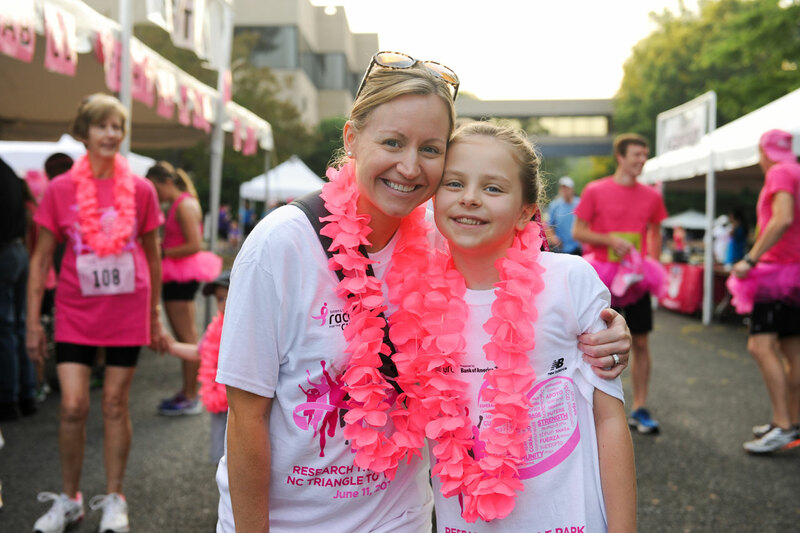 We structured the message to list North Carolina’s breast cancer statistics first and then define how Susan G. Komen is working to change those numbers. We then outlined the ways businesses can help through their sponsorships and how local affiliate Komen NCTC allocates its funds. We highlighted our call-to-action with short sentence structure (“This is our state. These are our stats. And it’s our responsibility to change them.”) and a bold typeface. But, we lightened the overall tone with heartwarming photographs that mimic the curve of the breast cancer ribbon. A postcard and poster encouraged businesses to be a sponsor. 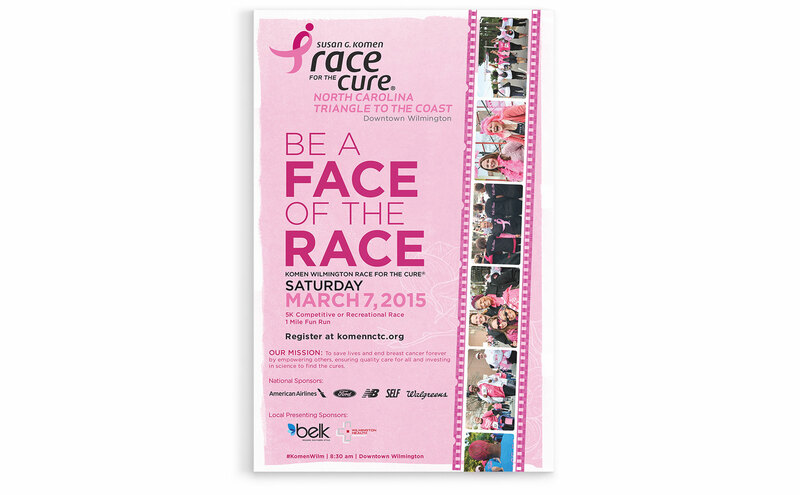 A luncheon flyer, email header, and social media graphics advertised the race and provided information to participants. We’re proud to support the Susan G. Komen® NCTC organization in its efforts to combat breast cancer by defining and executing its annual marketing campaign initiatives.